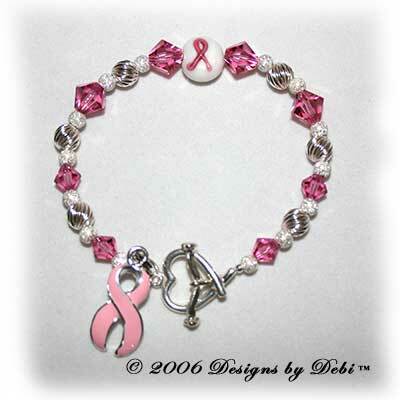 These beautiful sterling silver and Swarovski® crystal Awareness Bracelets are made with a glass or sterling silver oval ribbon bead (depending on availability); sterling silver beads in your choice of 4 styles; Swarovski® crystals in the color of the cause; a sterling silver heart-shaped ribbon toggle clasp and an enamel silver-plated ribbon charm. 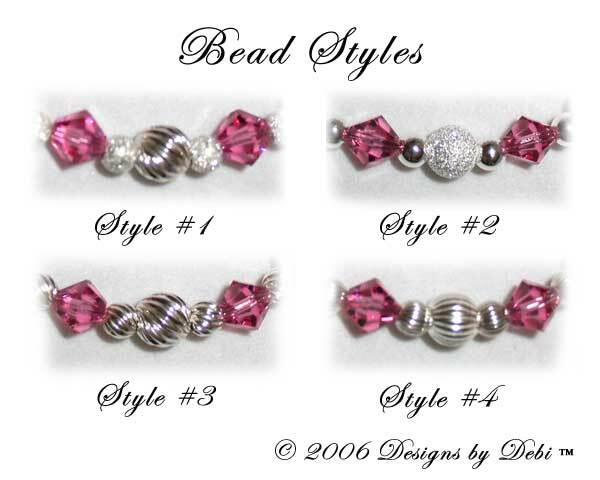 The pink bracelets shown are each done in one of the 4 styles. 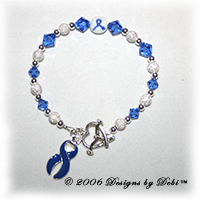 "Survivor" or "In Memory" dangles with matching crystals can also be added to your bracelet if you wish. These dangles are an additional $10.00 each. If you are unsure what color represents your favorite cause or are curious what the colors represent, you can take a look in the Reference Center. 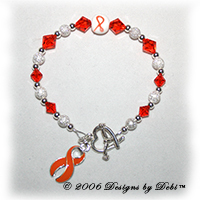 I have listed the Awareness Ribbon colors in alphabetical order by color and by the Cause they represent to help you. 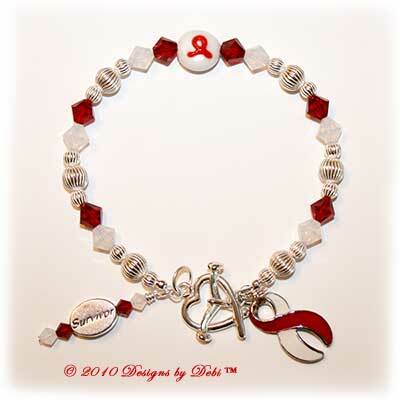 Awareness Bracelet sale is donated to charity. 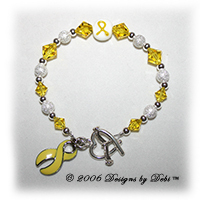 A portion of the proceeds from the Yellow Military Support Awareness Bracelets will be donated to Soldiers' Angels (along with donations from the sale of Support Your Soldier Bracelets™). 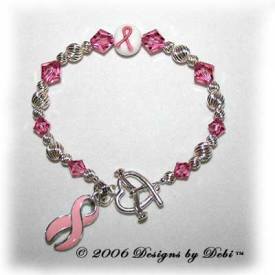 A portion of each sale of an Awareness Bracelet for a cause related to children will be donated to St Jude Children's Research Hospital. 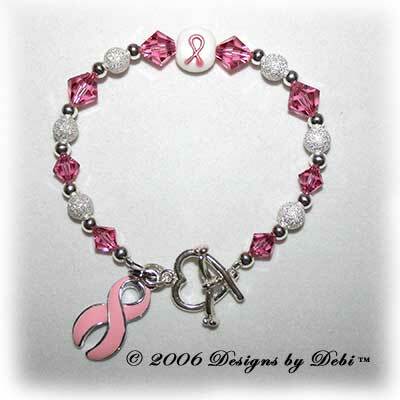 A portion of each sale of an Awareness Bracelet related to Cancer will be donated to Stand Up To Cancer. 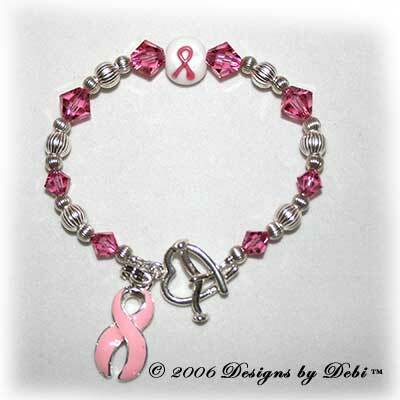 For the rest, I will do my best to donate to a cause specific to each bracelet purchased. When the resulting amount makes it unreasonable, it will be added to the Stand Up To Cancer donation.